From the peaks of the Cascades, across the coastal rainforests of the Olympic Peninsula, to towering volcanoes like Mt. 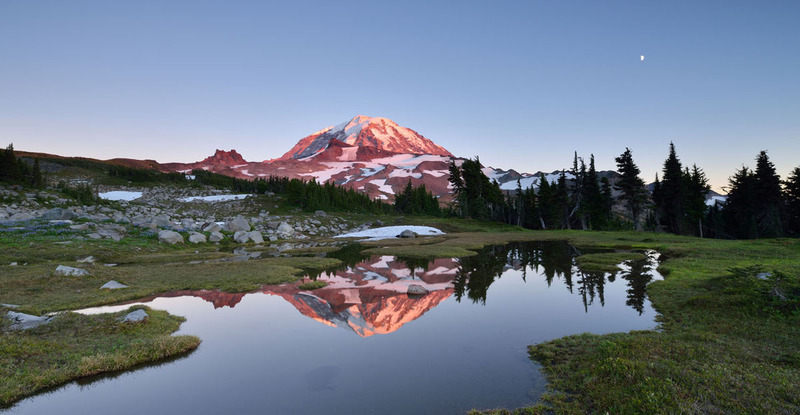 Rainier, hiking Washington’s diverse landscapes is an experience unlike any other. The trails, many of which pass through beauitful Northwest forests with snow-capped peaks in the distance, are well kept and offer challenges for all levels of experience. Our picks for the best day hikes near Seattle below run the gamut from easy and popular trails just outside of the city to some of the toughest day hikes around. Enjoy! For a short and relatively easy day hike, it doesn’t get much better than a gently-sloping trail through old growth forest, a view over Snoqualmie Pass and the Southern Cascades, and a trailhead only 40 minutes east of Seattle. 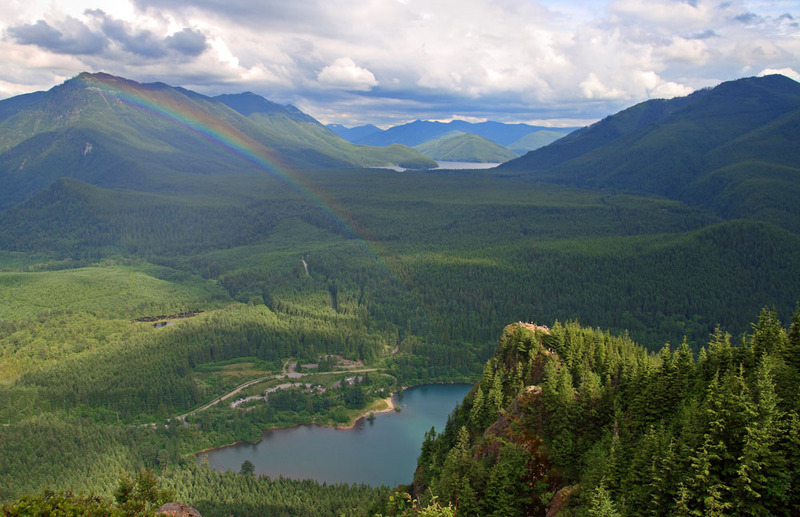 The hike starts off on the shores of Rattlesnake Lake and cuts through a series of switchbacks that rise 1,000 feet over 1.5 miles. The path is steadily uphill but never overly difficult, which means that the ledge is crowded on weekends and sunny summer days (it’s a great option for watching the sunset after work or as a trail run). Before or after the hike, the lake itself is a great place to relax, walk, swim, and fish. For tougher hikes near the city, popular Little Si and Mount Si (below) across the valley are similar but slightly more challenging. The easy access to Little Si and Mount Si make them two of the highly-trafficked day hikes in the Seattle area. We like Little Si best, which is a 5-mile roundtrip excursion with around 1,200 feet in elevation gain. The forested path is excellent and there are a number of interesting rock formations along the way (it’s also very popular for climbing). 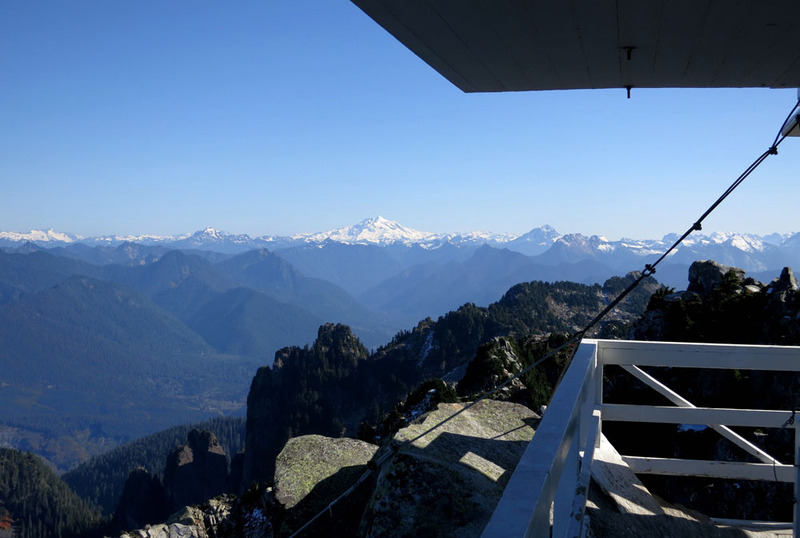 The top has good views of North Bend, the Upper Snoqualmie Valley, and Mount Si hovering above to the north. Mount Si is a more involved day hike at a distance of 8 miles roundtrip and with an elevation gain of around 3,150 feet. It’s not that Mount Si isn’t a really nice hike, it’s just that we think there are better options for that kind of effort (see Granite Mountain below). But you can’t knock the proximity to Seattle—both Little Si and Mount Si are accessed via exit 32 on I-90, less than a 45-minute drive from downtown. For a moderate one-day summit from Seattle, it’s tough to find a better hike than the one up Mt. Pilchuck. Located on the Mountain Loop Highway just over an hour north of downtown, this hike offers big-time scenery quickly and will not disappoint. You rise with views of the North Cascades and classic alpine terrain, finally curling around the summit for huge expanses including the Olympic Peninsula, Puget Sound, San Juan Islands, and Mt. Rainier. This hike is only 5.4 miles roundtrip but relatively steep and therefore intermediate in difficulty. The biggest issue with Mt. Pilchuck is the crowds. In many ways, this is the mini-Mt. Everest of Seattle—we’ve hiked it on a clear summer Sunday and literally been in a line of 30-40 hikers near the top. Even on a blustery February weekday we came across 20-30 hikers battling snow and ice along the way. This doesn’t mean that you shouldn’t do Mt. Pilchuck, just try to get up early. If you can depart your Seattle home by 6am, grab a double latte, and hit the road, you can be at the trailhead by 7:30am. By doing this you will avoid the vast majority of people. Show up at 11am and you may see your neighbors and coworkers up there too. 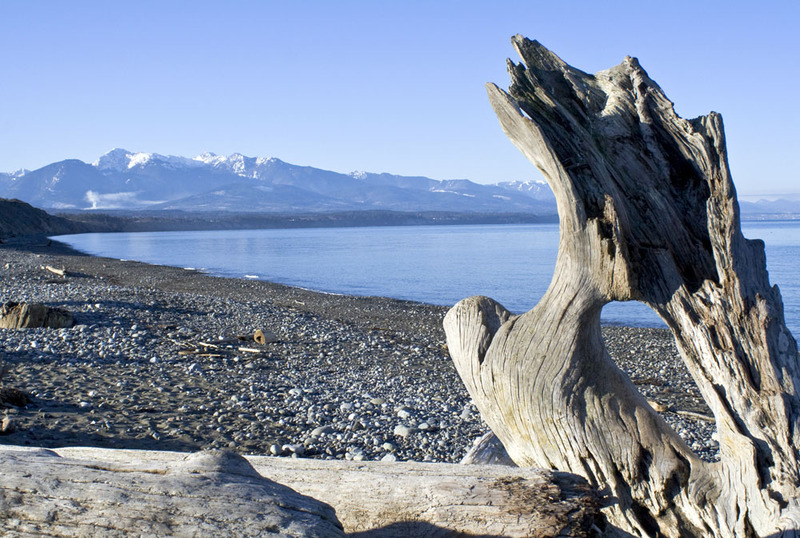 Perched on the western shore of Whidbey Island with views of the Olympic Mountains and Strait of San Juan de Fuca, Ebey’s Landing is our favorite Washington coastal hike. 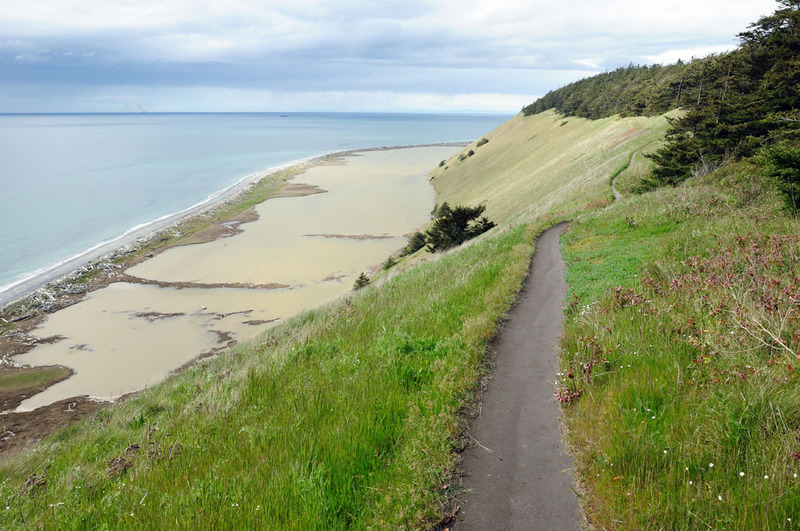 Named after Issac Ebey who built the island’s first settlement, this trail passes high along the bluff with excellent opportunities for wildlife watching, including bald eagles soaring along the cliffs, seals and sea lions playing in the surf, and even orca pods feeding on salmon in the summer. Toward the end of the bluff, the trail intersects the original and restored homestead from 1850 before zigzagging down the side of the cliff to the stony beach (an easier option is to return the same way via the high side of the bluff). This is a superb early morning and sunset hike, although it’s excellent anytime the views are clear. If you can only do one summer full-day hike in Washington, the hike to Summerland in Mt. Rainier National Park is your best bet. This pristine alpine meadow is the starting point for climbers heading up Mt. 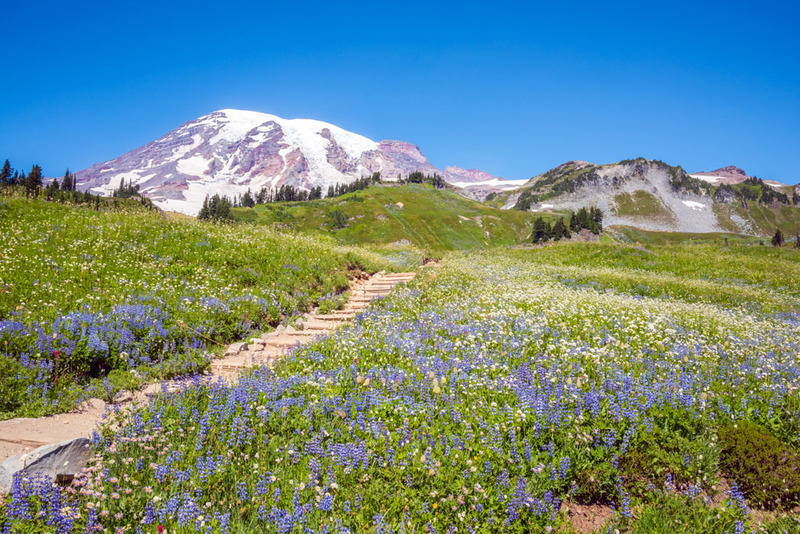 Rainier’s southern slopes and one of the best places in the state to view wildflowers. The trail passes upward through old-growth forests along the White River until the trees give way to spectacular mountain vistas. Summerland, which is 4.2 miles from the trailhead, is an open meadow full of marmots, wildflowers, and spectacular views of Mt. Rainier. For those looking for more mileage, Panhandle Gap is another 1.4 miles from Summerland. This is a popular trail and it’s best to get started early before the bulk of the crowds arrive. Camping is possible in Summerland but spaces are limited and drawn via lottery months in advance. The Chain Lakes Loop offers a grand tour of the North Cascades: towering peaks, wildflower meadows, shimmering lakes, and great views of Mt. Baker and Shuksan. From the Bagley Lakes Trailhead, the path leads past a series of lakes—some still bordered by snow late into the year—and up the Herman Saddle. The trail then navigates the pass between Table Mountain and Ptarmigan Ridge before continuing to Artist Point. Famous for the imagery of Mt. Shuksan reflecting in its waters, Artist Point is one of the highlights of hiking in the North Cascades. For those who don't have time for the entire loop, it’s also possible to park at the Artist Point lot and go directly to the lake (when the road is open). The Chain Lakes Loop is crowded on summer weekends but much less so during the week. Dungeness Spit is the longest coastal spit in the United States and one of our favorite coastal hikes in Washington. The narrow 5.5-mile long Spit, all of which is designated as the Dungeness National Wildlife Refuge, juts out from the northern coast of the Olympic Peninsula into the Strait of Juan de Fuca. At the end of the journey is an historic lighthouse and views of the Cascades and San Juan Islands. The area is great for bird watching and spotting sea life: bald eagles often fly overhead and sea lions and seals come ashore to rest amidst the driftwood. Although the Spit is flat, it is rocky and the walking can take longer than it would on a normal dirt trail. And make sure to bring proper sun protection as there are very few places to find shade. The Kendall Katwalk in the Cascades is an impossibly-thin ridge that makes up a spectacular section of the Pacific Crest Trail. Located off I-90 via Exit 52, the Katwalk is considered to be one of the most scenic mountain areas in Washington. The hike begins in an old growth forest, and as the elevation increases, the tree line falls away with great views of the Cascades and Mt. Rainier. After crossing a series of meadows and alpine rock fields, the trail climbs to the top of the ridge. 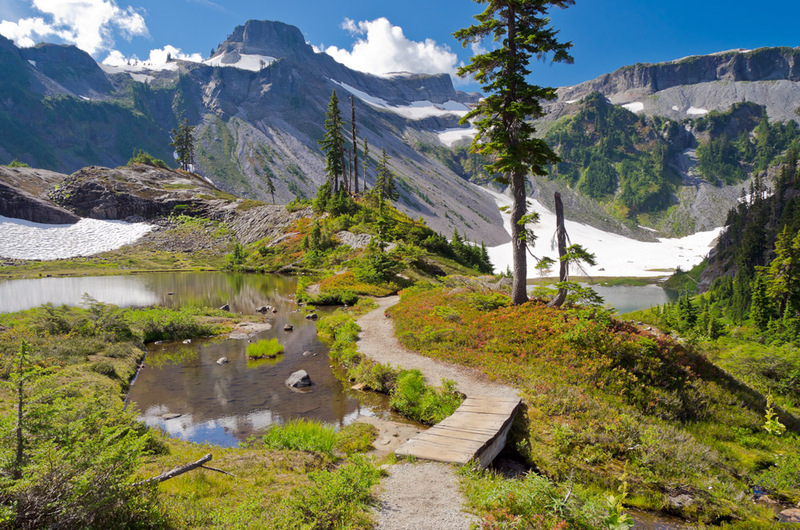 The Kendall Katwalk itself is approximately 5.5 miles from the trailhead (11 miles roundtrip) and you can continue on to hike along a series of beautiful alpine lakes. This area also makes for a great overnight backpacking trip. 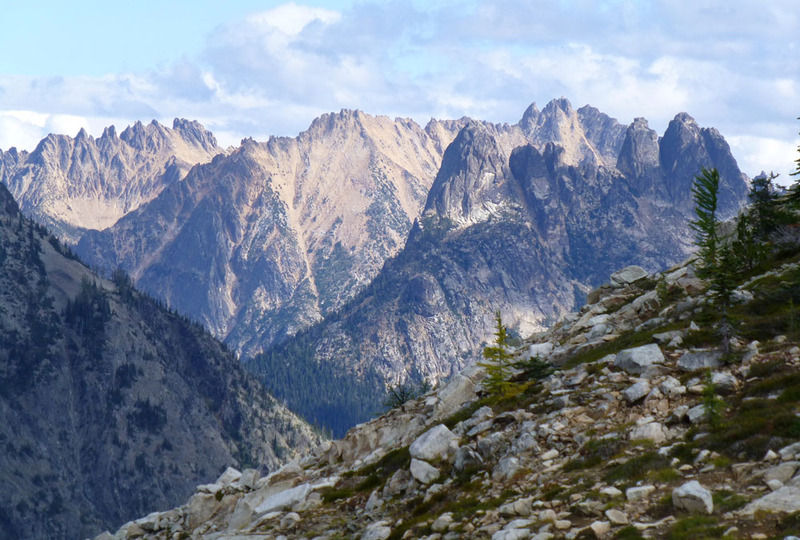 Perhaps the most stunning day hike in the North Cascades, and even all of Washington, is the Maple Pass Loop off the North Cascades Highway. We should start by mentioning that with driving, this hike makes for a very long day. It’s approximately three hours (of incredibly beautiful scenery) to the trailhead, and the hike itself is another 7.2 miles. But this is all attainable in a day and we think it’s well worth it. If you’re up for more of an adventure, you can camp in one of the public campgrounds in the Methow Valley before or after, which makes for a great one-night trip from Seattle. The Maple Pass Loop starts at the Rainy Pass trailhead on Highway 20 approximately 50 miles east of Marblemount and 22.7 miles west of Mazama. In a relatively short 7.2 miles return, you will hike through alpine meadows, past pristine lakes, and experience views of the high peaks of North Cascades National Park. You can hike Maple Pass in either direction—we prefer counterclockwise for the best views of the National Park on the way up, but this also results in more knee-pounding on the way down. If you hike clockwise, the steepest section is up and much of the rest is smooth sailing. The Enchantments outside Leavenworth are one of Washington’s great natural treasures and it’s nearly impossible to overstate their beauty. Granite buttresses, glacier-rimmed lakes, alpine meadows, wildflowers, and mountain goats all make this one of the best hiking areas in the Northwest. Permits to camp here are awarded by a highly-contested lottery that takes place in the spring, with a limited number of permits handed out at the ranger station each morning from May through September (also via lottery). But you can day hike the entirety of the Enchantments via the extremely challenging Enchantments Traverse. Most hikers reach the Enchantments via the Snow Lake Trailhead, and the other option—the Stuart Lakes Trailhead—is another 9 miles past the Snow Lakes Trailhead. It’s 18 miles from one trailhead to the other, and both entrance points require significant elevation gain to reach the bottom of the Enchantments Basin (approximately vertical 6,000 feet from Snow Lake and 4,400 from Stuart Lakes). 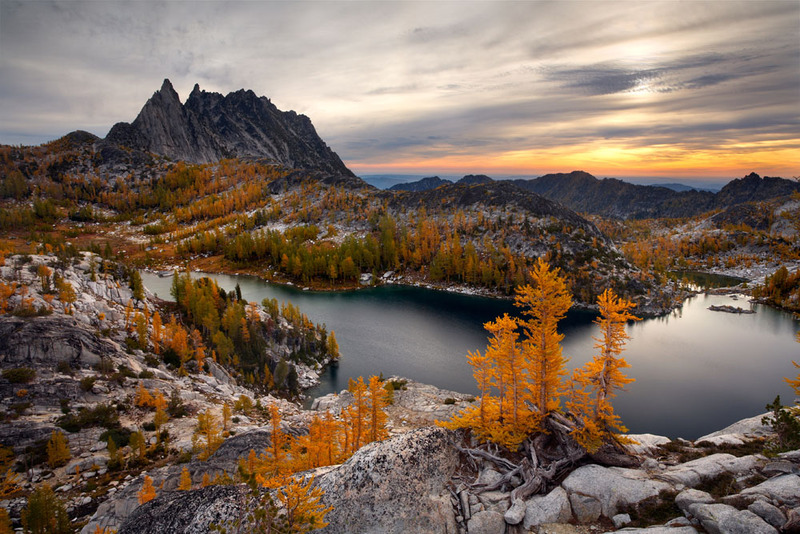 The full Enchantments Traverse is possible as a grueling day hike with transportation pre-arranged, but most people opt for 2 or more nights to explore the beauty of the Core Enchantment Zone. For trip reports and trail maps, see the Washington Trails Association website.